Hearing your child say her first word is a thrilling moment, and a huge step in her expressive language development. Your child acquires a new speech skill, and then loses it. Your child is well into her 15th month and hasn’t said a recognizable word. At age 2 your child isn’t beginning to combine words. Between 12 and 15 months, first words emerge. 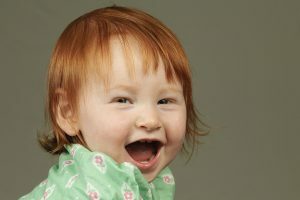 Your toddler quickly learns that this new way of communicating is efficient, effective, and garners lots of attention! Her vocabulary hasn’t caught up with her excitement and motivation to talk, though, so she may get frustrated if she’s trying to tell you something but doesn’t have the words. The good news is that she has various gestures in her communication repertoire, which help her get her points across. You’ll see her begin to combine words and gestures during this stage, like saying “bye” while waving. Imitation is a primary building block of learning, and your little one imitates words she hears, even if she can’t yet pronounce them or understand their meaning. Aside from words, she also copies inflection. She may raise the tone of her voice at the end of a question, for instance. You also hear her practicing intonation when she babbles, which at this stage sounds like she’s having a full conversation in another language! Coordinating the lips, tongue and teeth to make consonant sounds takes time to develop, so you’re doing a lot of interpreting and translating. You may have to learn that “at” means “cat,” for example. On average, toddlers speak 10-20 words during this stage and still babble a lot. As your little one’s ability to coordinate her lips, tongue and teeth improves, she begins to make more consonant sounds (including p, b, t, k and g). To appreciate the skill required to form these sounds, try making them while paying attention to how your tongue hits different parts of your mouth and teeth, and notice the subtle difference between making a “p” or a “b” sound. She’s realized the power of words by now, and she says them forcefully: “Mama!” to get your attention, “Mine!” to let you know she’s not happy about you moving her teddy bear, or “No!” when she does not want to eat peas. She also starts to combine two (maybe even three) words together. Although her speech is steadily becoming clearer, your days of interpreting and translating aren’t over yet. At this stage she may use the same word for several similar things, like “wawa” when she’s talking about water, milk, or juice. Throughout this stage, pronunciation and correct use of words continues to improve, and babbling decreases as your little one adds new words and short phrases at a steady pace. By 24 months, most children speak 50 words or more. It’s normal for children to use incorrect grammar at this age, like referring to themselves by name in the third person. They experiment with using personal pronouns (me, you, he, she, etc. ), and possessive pronouns (my, your, his, her, etc. ), but these are sill complex concepts that your toddler will mix up frequently. Grammar will steadily improve alongside your toddler’s memory. Usually by age 4, most grammar quirks disappear. As you enjoy this communication adventure with your little one, be sure to browse the speech area of our BabySparks program, where you’ll find dozens of fun activities you can do with your child to support her language learning.